Those looking for a schooling species to brighten up the middle water layer of the aquarium will inevitably end up considering tetras. With the endless colorful species out there it’s guaranteed there’s a tetra for you: some of the most classic aquarium fish are tetras. To celebrate the beauty of tetras, we’ve compiled a list of 13 types of tetras that are guaranteed to draw anyone’s eye to your aquarium. 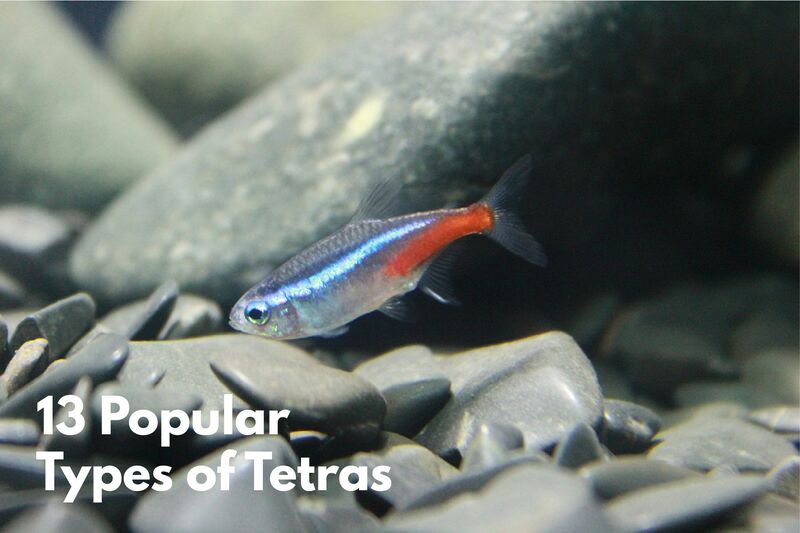 What better way to start off a list of tetras than with the most classic species out there? 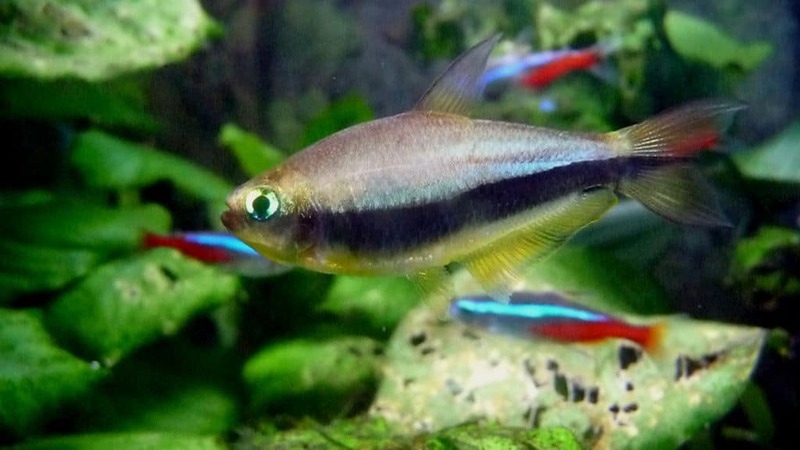 Even most non-aquarists have heard of the neon tetra at some point, and for good reason. This small schooling fish lends its name from its eye-catching blue, red and silver coloration. Neon tetras have been popular in the aquarium hobby for as long as anyone can remember due to their colors, but there’s more to them than that. They are also loved for their temperament (peaceful and community proof) and hardiness. Keep your neon tetras in a rectangular aquarium of at least 15 gallons to provide the swimming room they need. Go for a group of at least 8 but ideally more fish, as schooling species will become shy and withdrawn when safety in numbers is lacking. Combining males and females comes with the added bonus of being able to see the species’ natural spawning and sparring behavior. Did you know? There is also a black neon tetra (Hyphessobrycon herbertaxelrodi), which looks very similar to the normal version but lacks red coloration. A great option if you want something a little more uncommon, or even mixed with regular neons! Additionally, you could consider the slightly larger cardinal tetra (Paracheirodon axelrodi) or the more blue-greenish green neon tetra (Paracheirodon simulans). Interested in keeping tetras but looking for something slightly more ‘original’ than the ever-popular neon? You might like the equally beautiful but less frequently kept lemon tetra. Healthy fish of this species display beautiful silver coloration with neon yellow fins and orange eyes. Like most of the small tetras, the lemon tetra is a peaceful species that works perfectly in the community aquarium. Its yellows and oranges add a bright note to the tank and its hardiness means that this fish is suitable even for beginners. Just keep the water soft and relatively acidic to imitate the species’ natural habitat. Lemon tetras grow to a maximum size of around 1.5” and are active swimmers, which means you’ll need a rectangular aquarium of at least around 20 gallons to keep a group. Provide plenty of cover in the form of live plants and other décor to help your fish feel safe. Tankmates should be peaceful and of a small enough adult size that they’re not able to eat this small tetra, which might be seen as an appetizing snack by larger species. 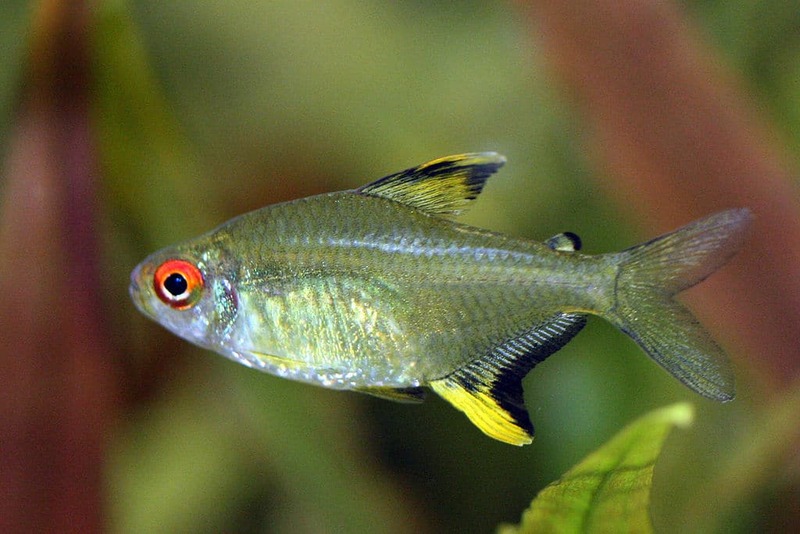 Significantly larger than the previously mentioned two species, the Buenos Aires tetra is also quite a bit more feisty. This red-finned tetra is active and assertive, making it less suitable for communities but all the more fascinating to keep. Buenos Aires tetras are known for their tendency to display nippy behaviors, but this doesn’t mean you should exclude them as an option for your aquarium altogether. Just make sure you don’t keep this species with slower tankmates that might easily become stressed, and get a large enough group so that the tetras can focus on territorial squabbles with their own species rather than pestering other fish. A rectangular 30 gallon aquarium is the absolute minimum tank size you should consider if you want to keep Buenos Aires tetras. Plant the tank heavily. Did you know? Buenos Aires tetras can thrive in a wide range of water temperatures. They make a great choice for unheated aquariums and will actually suffer when exposed to temperatures higher than around 77 °F for extended periods of time. The Congo tetra is a bit of an odd duck in this list of tetra types. Rather than most tetra species it isn’t naturally found in South America. Rather, as its name suggests, this species’ natural habitat is located in the Democratic Republic of Congo (Central Africa). We just can’t skip it though: this species is quite the eye-catcher. Congo tetras grow relatively large and need bigger aquariums than most tetras, but their stunning appearance makes the extra effort more than worth it. The females are beautiful to see, but it’s the males that really steal the show. Their long fins and shimmering blues and oranges make for a beautiful display. To top it all off, this species is peaceful and works well in some types of communities. Keep your Congo tetras in an aquarium of at least 55” (which comes down to 40 gallons and up, usually). Provide plenty of cover and avoid tankmates that might be nippy or, alternatively, too shy. Additionally, keep in mind that this isn’t an ideal species for those without much aquarium experience. Congo tetras can be a little sensitive to bad water quality and won’t be forgiving to beginner mistakes. The attractive glowlight tetra makes a great choice for those just starting out in the aquarium hobby, especially if they’re looking to set up a peaceful community aquarium. This small tetra is easy to keep and will cheer up any tank with its bright red and silver coloration. It can be found in most aquarium stores and is known for being quite hardy. You won’t need a large aquarium to keep glowlight tetras: a rectangular tank of 15 gallons or up should be enough for a group. In larger set-ups this species actually combines quite well with some of the other tetras on this list, like the equally colorful neon tetra. This tetra looks its best when kept in soft and slightly acidic water and makes a great option for South American biotopes. A blackwater aquarium would work well. Use plenty of leaf litter to stain the water and low-light live plants to provide cover. As paradoxical as it might sound, you’ll actually see your fish more if you provide more hiding places, as they’ll feel safe enough to venture out into the open if they know they can dart into hiding if need be. 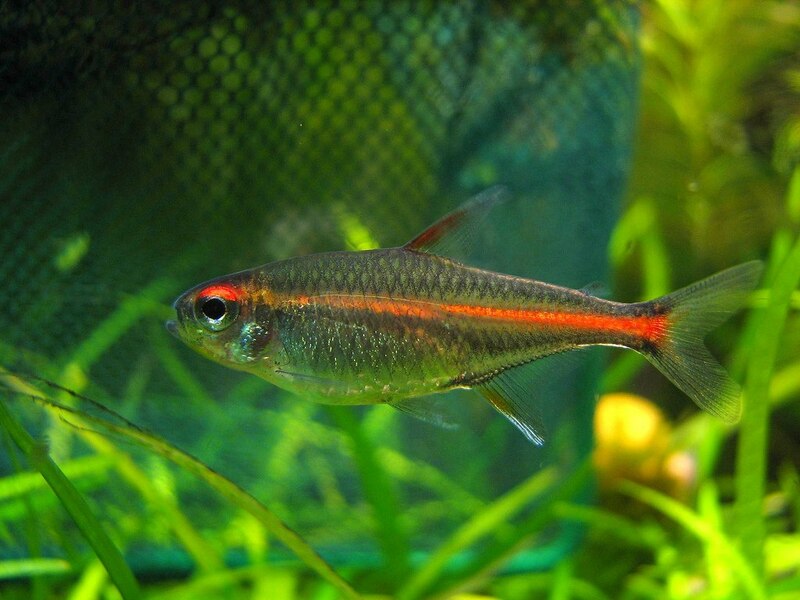 Another perfect tetra for beginners is Aphyocharax anisitsi, better known among aquarists as the bloodfin tetra. A group of these silverish, red-finned fish looks quite spectacular in your aquarium, especially if you keep at least 10. The species is hardy and can adapt to a pretty wide range of water values and temperatures. 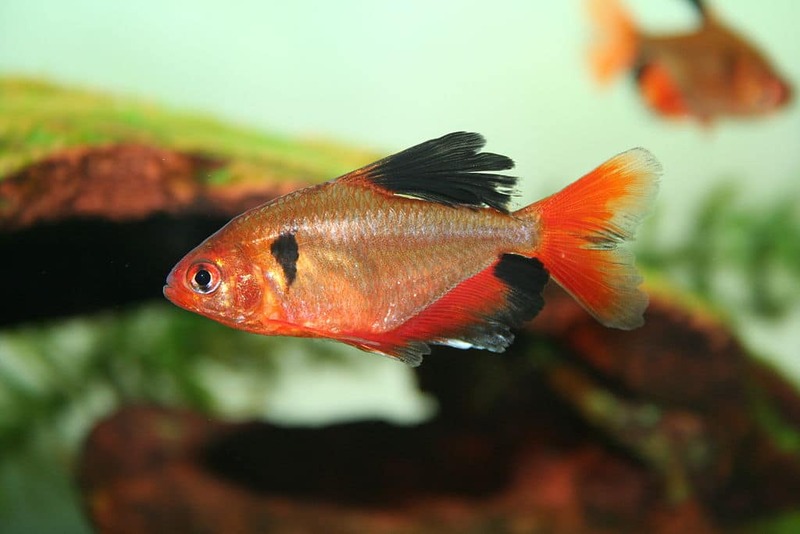 Bloodfin tetras don’t grow very large, but because they are so active it’s a good idea to go for at least a 20 gallon long tank if you’d like to keep them. Plant and decorate the aquarium heavily and be sure to avoid very slow or fragile tankmates: this species is known to nip on other fish’ fins from time to time. Did you know? Feeding your tetras commercial dried foods is fine, but try to switch things up with the occasional frozen or even live foods from time to time. These fish are naturally omnivores that will feed on small insects if they can find them, meaning they’ll really appreciate the occasional opportunity to hunt. Maintaining a colony of live food isn’t as hard as some might think! Coming in at just under an inch, the ember tetra is the tiniest fish on this list. It makes the perfect choice for those that don’t want to set up a large aquarium, as you won’t need much more than a 10 gallon to keep it. Do make sure to go for a long tank, as all tetras including this one appreciate plenty of horizontal swimming room. 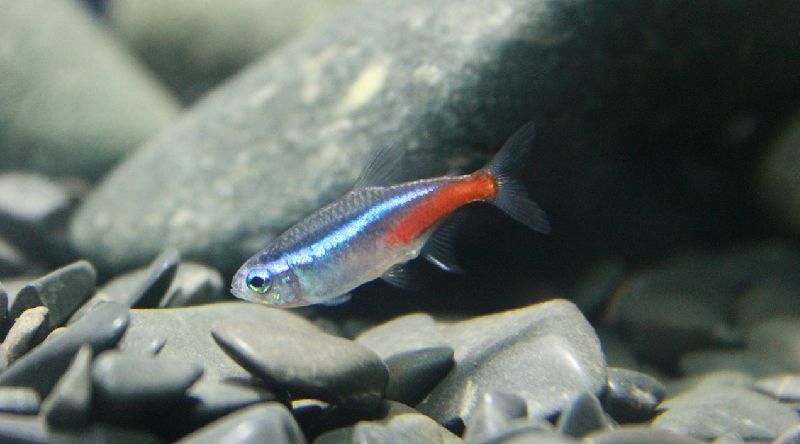 Ember tetras show their best coloration (from which they lend their name) in a well-planted aquarium, preferably with plenty of leaf litter to stain the water. Soft and slightly acidic water is ideal. 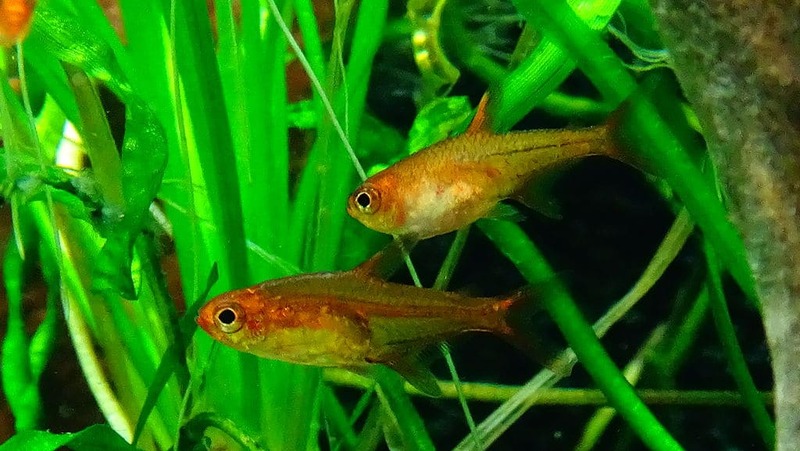 Prevent tankmates that are too large or might have an appetite for smaller fish: the ember tetra is peaceful and its size makes it somewhat vulnerable. The larger the group, the better this fish will look, as it schools quite tightly. If you’ve got a big aquarium at your disposal, consider splurging on 20+ ember tetras for a spectacular display that is sure to draw anyone’s attention! The bleeding heart tetra lends its rather dramatic common name from its color markings. Mostly silver and with red fins, the species is named after the bright red dot on the middle of its body. The bleeding heart tetra is a perfect choice if you’re looking to set up a calm, Brazilian-style blackwater aquarium. It naturally occurs in quiet habitats without strong water flow that feature plenty of cover and very soft, often highly acidic water. Dimmed lighting, driftwood, live plants and a large group of bleeding heart tetras make for a very spectacular display. Although the fish can withstand a relatively wide range of water values, it does best with a low pH. Combine plenty of male and female bleeding heart tetras if you’d like to see their natural sparring behavior. Keep in mind that the males of this species can be quite feisty, so they might stress out very peaceful tankmates. Try going for sturdier fish like Corydoras and dwarf cichlids instead. A colorful and attractive schooling fish with beautiful finnage that’s peaceful too? Yes, it exists! The regal emperor tetra makes a great addition to a peaceful community aquarium, even if you’re not an experienced aquarist yet. Its hardiness makes it forgiving to the occasional beginner mistake and it can adapt to a relatively wide range of water values and temperatures. If you’re interested in keeping emperor tetras, go for a rectangular aquarium of at least 20 gallons in order to provide plenty of room for a good-sized school. If you don’t keep this fish in sufficient numbers it might become more withdrawn and you’ll miss out on the males’ fascinating territorial displays, so be sure to get a school of at least around 10 specimens. Tankmate-wise the emperor tetra is very easy. It’ll co-exist peacefully alongside pretty much any species that requires similar water values and isn’t large enough to have an appetite for smaller fish. The ubiquitous black skirt tetra is another classic when it comes to tetras, long appreciated by aquarists all over the world for its easy care and interesting appearance. This species doesn’t have many specific requirements when it comes to housing and water consistency, making it a great choice for beginners and those looking for something low-maintenance. This decorative tetra works for peaceful community tanks and plays well with most common aquarium fish. Provide plenty of cover, but do keep in mind that this is an active swimmer that needs room to move around. The water should ideally be soft and acidic, but since most varieties are captive bred they are not too fussy when it comes to exact water values. Did you know? Not fond of the black skirt tetra’s colors? There is also an white variety of this species available in the aquarium trade. As their dark eyes reveal these white skirt tetras are not albinos: they are leucistic. 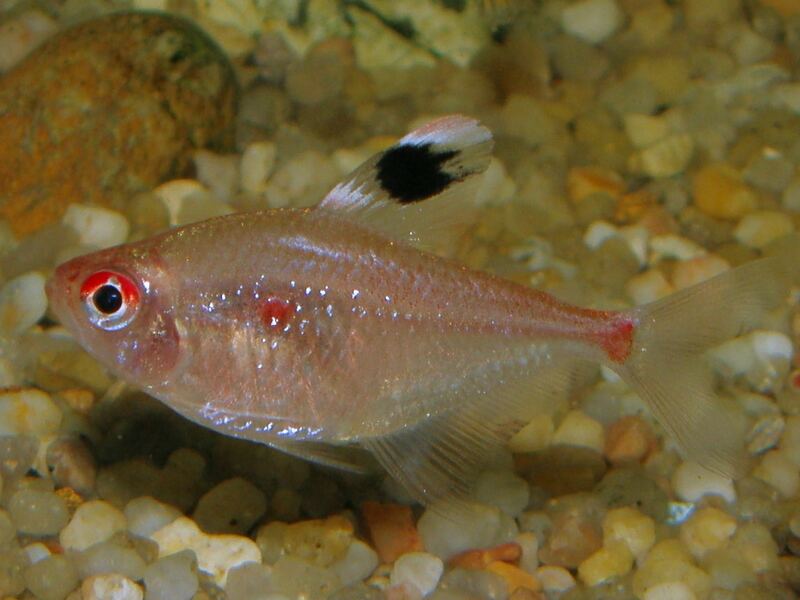 Sold as both ‘penguin tetra’ and ‘false penguin tetra’, Thayeria boehlkei is the most popular member of the tiny genus Thayeria. The ‘original’ penguin tetra is actually its close cousin Thayeria obliqua, which is why most sources refer to boehlkei as false. You’ll find boehlkei sold in aquarium stores under both names, but it’s safe to assume almost all penguin tetras you find for sale are this variety. Penguin tetras are a hardy and decorative species that looks great in a blackwater-style biotope tank but also works well in a regular community aquarium. Whichever aquarium style you go for, provide plenty of cover in the form of live (floating plants) and slightly dimmed lighting. Go for a reasonably sized school of at least 8+ fish and avoid very active or aggressive tankmates. 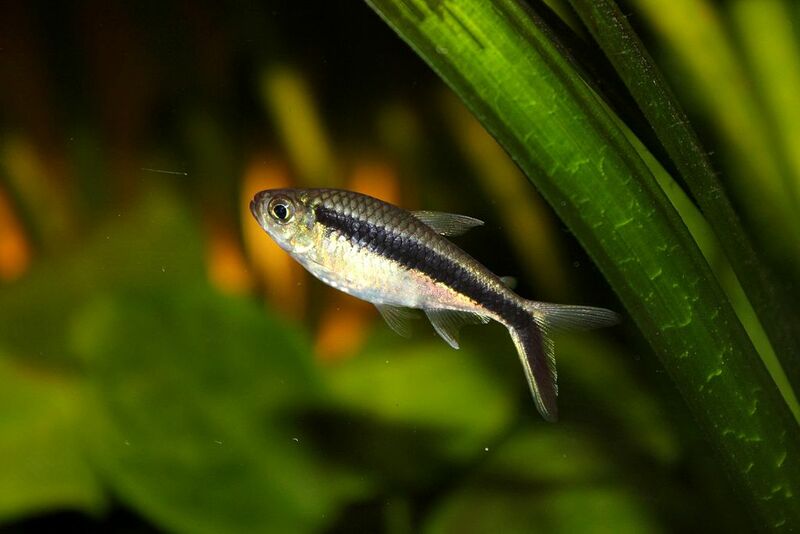 The false penguin tetra can reach a size of up to 2.4”. Although many sources recommend a minimum tank size of 15 gallons (long), we definitely prefer a larger aquarium for this species. A 30 gallon rectangular aquarium or even something larger provides all the space this schooling fish needs. 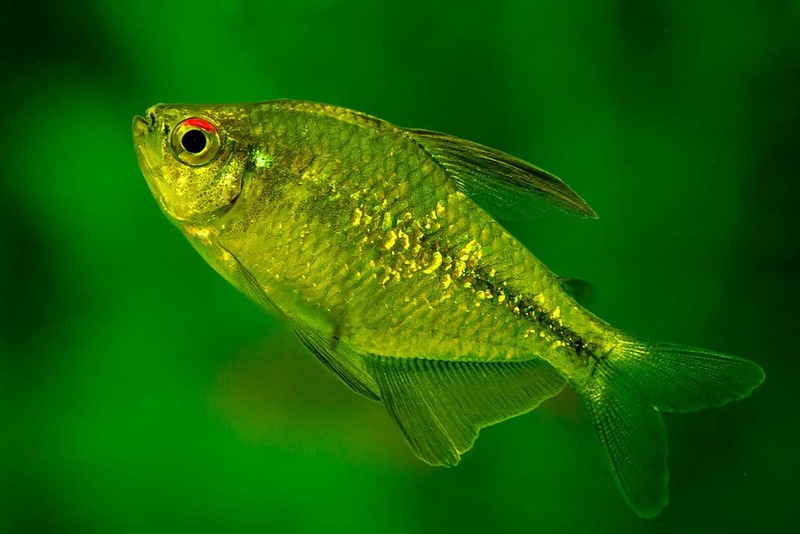 Because many aquarium fish including tetras are usually sold as juveniles in aquarium stores, some species tend to be overlooked due to their relatively bland looks. 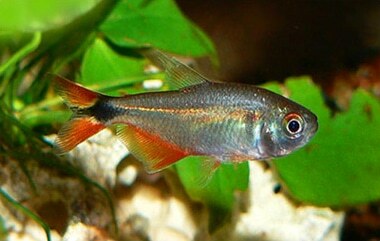 Moenkhausia pittieri, also known as the diamond tetra, is one of these species. Don’t be fooled by the juveniles’ average appearance, though: this shimmery species is an absolute stunner. In addition to being beautiful, diamond tetras are also relatively undemanding. Most are commercially bred and don’t have very specific demands when it comes to water values and temperature. Soft and slightly acidic water will work best, though, as do densely planted tanks with tinted water. Like many of the fish on this list, this tetra appreciates a South American style biotope with leaf litter, low-light plants and plenty of driftwood. A rectangular aquarium of at least 20 gallons is ideal. Keep a group of at least 8 fish to disperse nipping and aggression. Peaceful tankmates that appreciate similar water values work well, but due to its size you can also keep this species with some cichlids. In search of a tetra species that’s a little more feisty and can stand its ground? 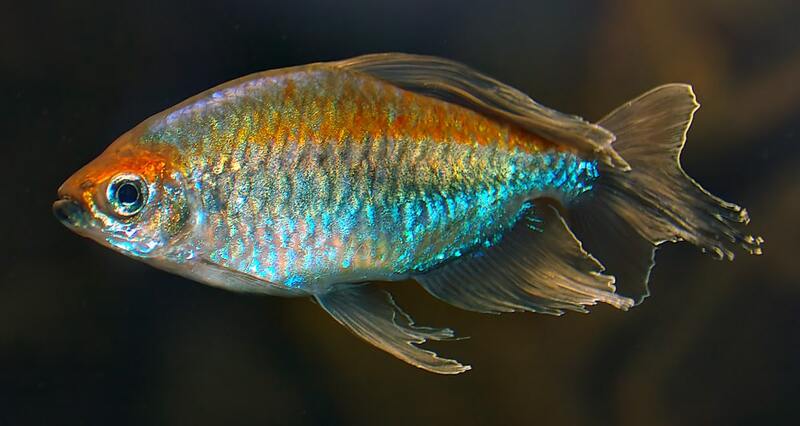 The serpae tetra is known not just for its stunning orange coloration, but also for its behavior. Although it doesn’t make the best community aquarium inhabitant, this species is definitely worth a shot for those that enjoy seeing their fascinating sparring behavior and don’t mind adjusting their stocking plan. If you’d like to keep serpae tetras, set up a biotope-style rectangular aquarium of at least 20 gallons (ideally more) and get a sizeable group of at least 10 fish. This ensures you’ll have both males and females, so that a hierarchy can be formed and you’ll be able to witness the males showing off and squabbling for territory. 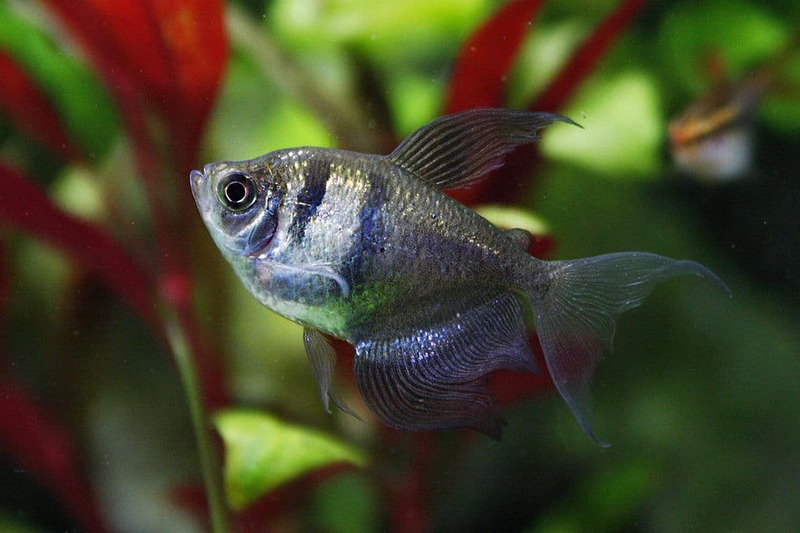 Avoid fragile tankmates, long-finned fish and anything that closely resembles a serpae tetra. Although keeping a large group of these fish lessens their aggression towards tankmates, they’re still known for being quite nippy and are best kept with more assertive species instead.